I used to yawn at white flowers in the garden. Boring! Bring on the color! I changed my mind when I once saw a formal garden with only white flowering trees, shrubs, perennials and annuals. The garden was understated and elegant. Various shades of green sparkled with a dab of white here, a splash of white there. There is therapeutic value in white flowers as well. For the vision impaired, the white flowers “pop” at dusk. The white flowers are similar to road reflectors on major highways. The flowers act as a guide in the garden. They lead you in the right direction and can act as spotlights at nightfall. Think of white flowers as a highlighter marker for a book. Too much white flowers during the day may hurt people with sensitive eyes. People with blue eyes or macular degeneration need sunglasses for protection. White flowers work best with curves on a walkway as guideposts, or as a contrast to dark green leaves or as a low plant near a border. This blog is written by a registered Horticulture Therapist with the American Horticulture Therapy Association. To learn more visit here. Thank you for stopping by. New next post will be about how to make a delicious mango smoothie! Hope to see you also on twitter! 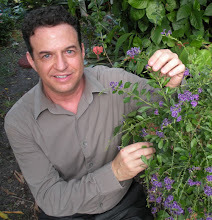 Miami Garden Reporter Subscribe to my articles for free. Facebook Garden Page Please "Like" my page and watch us grow. Today I picked some from my tree, a Cogshell variety that is simply one of the best tasting mangoes around. I picked the tree to grow in my garden since it branches low and you can prune it to stay shorter than most mango trees. Although the mango season is from May until October, each variety bears at different times. There are early season, mid season and late season varieties. They bear for about six weeks. At the height, you are inundated with them. My sink is now loaded. Time for a mango smoothie! Swap Shop - has lots of tropical fruit trees for sale. Living Color Garden Center - Wonderful place to visit due to the huge selection and wonderful display gardens. Spikes Grove Grand daddy of old time citrus stands, now also has a great selection of tropical fruit trees. Flamingo Road Nursery Has a beautiful garden center, butterfly garden and farmers market also. Support your local independent plant growers and buy local. Have a wonderful day.